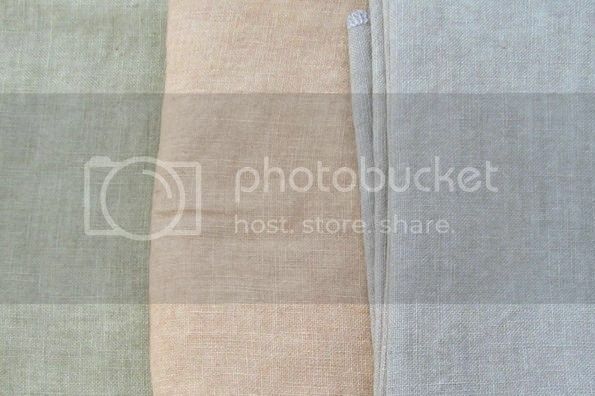 Great hand dyed linen, soft and great quality. All hand dyed fabric will shrink in the dyeing process, so the size of the linen is not exact, plus and minus 1-2 inches in length and width. Weeks Dye Works 30 ct Mocha Linen 17" x 26"
Weeks Dye Works 30 ct Mocha Linen 34" x 25"
Weeks Dye Works 30 ct Mocha Linen 34" x 53"
Weeks Dye Works 30 ct Lilac Linen 17" x 26"
Weeks Dye Works 30 ct Corn Silk Linen 17" x 26"
Weeks Dye Works 30 ct Putty Linen 34" x 53"
Weeks Dye Works 30 ct Guacamole 17" x 26"
Weeks Dye Works 30 ct Red Pear Linen 17" x 26"
Weeks Dye Works 30 ct Red Pear Linen 34" x 25"
Weeks Dye Works 30 ct Red Pear Linen 34" x 53"
Weeks Dye Works 30 ct Confederate Grey Linen 17" x 26"
Weeks Dye Works 30 ct Confederate Grey Linen 34" x 25"
Weeks Dye Works 30 ct Confederate Grey Linen 34" x 53"
Weeks Dye Works 30 ct Scuppernong Linen 17" x 26"
Weeks Dye Works 30 ct Scuppernong Linen 34" x 53"
Weeks Dye Works 30 ct Straw Linen 17" x 26"
Weeks Dye Works 30 ct Straw Linen 34" x 25"
Weeks Dye Works 30 ct Straw Linen 34" x 53"
Weeks Dye Works 30 ct Carrot linen 17" x 26"
Weeks Dye Works 32 ct Tin Roof Linen 17" x 26"
Weeks Dye Works 32 ct Cappuccino Linen 17" x 26"
Weeks dye Works 32ct Light Khaki Linen 17" x 26"
Weeks dye Works 32ct "Linen" Linen 17" x 26"
Weeks Dye Works 35 ct "linen" Linen 34" x 25"
Weeks Dye Works 35 ct "Linen" Linen 34" x 53"
WDW Blue Jean 35 ct Linen 18" x 27"
Weeks Dye Works 35 ct Mocha Linen 17" x 26"
Weeks Dye Works 35 ct Mocha Linen 34" x 25"
Weeks Dye Works 35 ct Mocha Linen 34" x 53"
Weeks Dye Works 35 ct Honey Suckle Linen 17" x 26"
Weeks Dye Works 35 ct Corn Silk Linen 17" x 26"
Weeks Dye Works 35 ct Beige Linen 34" x 25"
Weeks Dye Works 35 ct Beige Linen 34" x 53"
Weeks Dye Works 35 ct Tin Roof Linen 34" x 53"
Weeks Dye Works 35 ct Baby's Breath Linen 17" x 26"
Weeks Dye Works 35 ct Baby's Breath 34" x 25"
Weeks Dye Works 35 ct Baby's Breath Linen 34" x 53"
Weeks Dye Works 35 ct Parchment Linen 34" x 25"
Weeks Dye Works 35 ct Parchment Linen 34" x 53"
Weeks Dye Works 35 ct Confederate Grey Linen 17" x 26"
Weeks Dye Works 35 ct Confederate Grey Linen 34" x 25"
Weeks Dye Works 35 ct Confederate Grey Linen 34" x 53"
Weeks Dye Works 35 ct Cappuccino Linen 34" x 25"
Weeks Dye Works 35 ct Cappuccino Linen 34" x 53"
Weeks Dye Works 35 ct Putty Linen 17" x 26"
Weeks Dye Works 35 ct Putty Linen 34" x 25"
Weeks Dye Works 35 ct Putty Linen 34" x 53"
Weeks Dye Works 35 ct Straw Linen 17" x 26"
Weeks Dye Works 35 ct Straw Linen 34" x 25"
Weeks Dye Works 35 ct Straw Linen 34" x 53"
Weeks Dye Works 35 ct Red Pear Linen 17" x 26"
Weeks Dye Works 35 ct Red Pear Linen 17" x 25"
Weeks Dye Works 35 ct Chick Pea Linen 17" x 26"
Weeks Dye Works 35 ct "Linen" Linen 17" x 26"
Weeks Dye Works 40 ct Linen Beige 26" x 34"
Weeks Dye Works 40 ct Linen Beige 34" x 52"
Weeks Dye Works 40 ct Linen Putty 31" x 31"
Weeks Dye Works 40 ct Linen Putty 31" x 62"
Weeks Dye Works 40 ct Linen Cocoa 33" x 26"
Weeks Dye Works 40 ct Linen Cocoa 53" x 34"
Weeks Dye Works 40 ct Linen Straw 33" x 25"
Weeks Dye Works 40 ct Linen Confederate Grey 25" x 34"
Weeks Dye Works 40 ct Mocha Linen 33" x 26"
Weeks Dye Works 40 ct Linen Mocha 52" x 34"